perfect choice for most printers on the market. cause the filament to get caught in extruder gear. TPU (Thermoplastic Polyurethane) is a subclass of thermoplastics which prints strong parts that are also flexible. 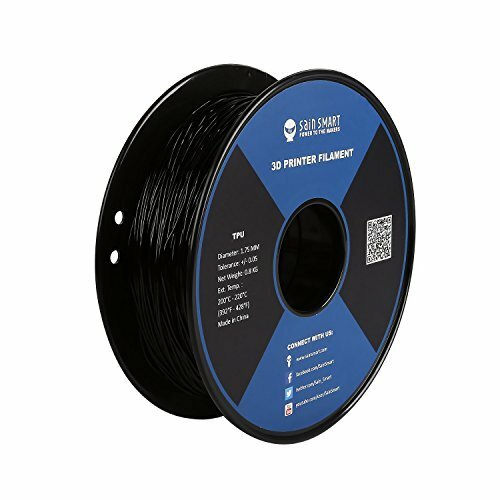 Compatible with all FDM printers on the market that accept 1.75 mm filament. Including Prusa i3, Monoprice MakerSelect, SainSmart xCreality, WanHao & Qidi, and other RepRap printers. With proper settings, TPU is easy to print thanks to excellent bed adhesion and the filament's tendency to not warp. Great for a variety of projects, such as shoe insoles, watch bands, phone cases, drone parts and more!